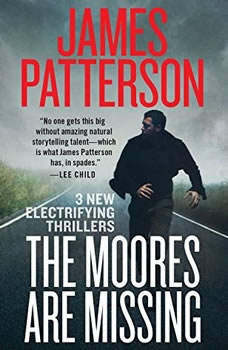 From the world's #1 bestselling writer - 3 pulse-pounding novels in one book!THE MOORES ARE MISSING with Loren D. Estleman: The Moore family just vanished from their home without telling a soul. A last-minute vacation? A kidnapping? A run for their lives? You'll never see the truth coming.THE HOUSEWIFE with Sam Hawken: Maggie Denning is a former chief detective adjusting to a quiet life in the suburbs with her family. But when the woman next door is found brutally murdered, Maggie starts investigating - everyone's a suspect. Even her own husband.ABSOLUTE ZERO with Ed Chatterton: They slaughtered his friends and framed him for murder. Now, Special Forces vet Cody Thurston is a fugitive who will stop at nothing to complete one last mission: revenge.